Unfortunately, all too often the link between supply and demand is broken or is not too precise. Many retailers receive shipments of merchandise from their suppliers in �prepacks� and then send these along straight to their stores, believing incorrectly that a) the relevant unit of analysis is the style and not the item and/or b) that it is not worth the time and effort to place orders, and sort them in their warehouses, at the item level (size & color). This is a serious mistake, since prepacks by definition follow a standard distribution of sizes, usually some variation of a bell curve. However, human beings do not fit neat statistical patterns and every time we have run Size Distribution of Sales reports for our customers, we have been surprised by how much variation we see: a particular woman�s black boot may sell a lot of sizes 8s and 5s and the same boot in a different color may sell a lot of 6s and 5s while a similar boot with a higher heel may sell predominately sizes 9 and 10. Customers are a wonderfully varied lot and making it impossible to predict the distribution of your sales with any great accuracy. Retailers whose distribution system relies on prepacks are without a doubt carrying substantially sub-optimal inventory. Usually, items in the middle of the size run sell out first, at which point the retailer then orders another prepack to restock that item as quickly as possible, but the other sizes, particular those on the end of the size run, have not sold out, so excess inventory begins to accumulate. 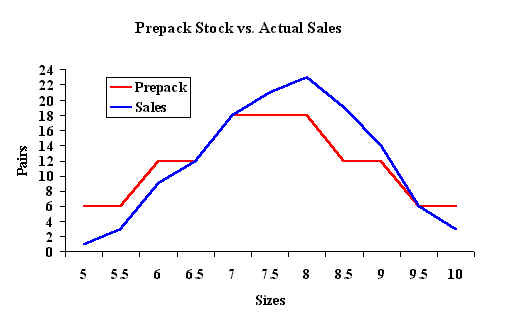 In the graph below, we have shown a hypothetical example where the prepack follows an even distribution in increments of 6, 12 and 18 pairs while the actual sales follow a more random distribution, in this case, showing that larger sizes are more popular for this style. For those sizes where sales are below the prepack level (sizes 5 � 6.5 & 10) the retailer is overstocked; for those sizes where sales are above the prepack (sizes 7.5 � 9) the retailer is understocked. This leaves the retailer with two unpleasant options: order another prepack, in which case he will accumulate even more unnecessary stock (in sizes 5 � 6.5 & 10) or wait till he sells the remaining inventory in these sizes in which case he is losing sales in the sizes that are out of stock (sizes 7.5 � 9). The problem is multiplied every time the retailer reorders a prepack or waits to sell-down inventory. We had one customer whom we discovered had 24 pairs in inventory of the smallest size of a particular style. Why 24? He had ordered 24 prepacks in the last year every time the best-selling size sold out and not once had he sold a shoe in the smallest size. Every time he ordered a prepack he was accumulating a souvenir--and a very expensive one at that! Some retailers know prepacks are inaccurate but argue that it is not worth the extra expense to implement an item-based inventory control system that gives them greater accuracy. These retailers� main concern is speed: they like to order the prepacks from their vendors and deliver them as is to their stores, the quicker the better, to make room for the next shipment. Our experience has shown that typically a quarter of a retailer�s inventory is stagnant, i.e. stock levels are much higher than sales while sales could be 20% higher if they made sure to never be sold out of items that customers are looking for. These are huge numbers that translate into substantial profits and far outweigh the additional costs that controlling inventory at the item level entail. Information is a lot cheaper than shoes or transportation costs. Regarding the argument that item-based inventory control slows down the distribution system, remember our friend the Chicago retailer whose sales kept growing but profits were disappearing¾a clear case of over-supply ruining GMROI (Gross Margin Return on Investment). Speed is not an inherently good thing to have; it is a catalyst and will accelerate the consequences of your decisions, good or bad. If excess inventory is eating away at your profits, then selling and ordering even more prepacks will not help. The goal of any retail operation, after all, is higher profits, not necessarily more sales that drag down the bottom line. Now prepacks are not a uniformly bad idea. If a given stores has a certain sales volume then maybe it wouldn�t hurt to send them one prepack to start off with, but then they need to fill in per size color as the initial shipment sells to improve accuracy. Often vendors allow you to order �pre-packs� and one-size packs (for example 12 pairs of size 9). So based on past experience you could track that you need one prepack per store plus a certain amount of one size packs per certain sizes. Our point here is that you need an automated system to be able to fill in the holes where these extra shoes are needed. It will not always be the same size at the same store. The strength of a big chain of stores versus a single store should be their ability to statistically �even out� their sales. In any given sales period, a certain store can sell an unusual amount of size nines while another can sell a weird amount of size 6. However, when you take the sales of the full 40 stores it will be unusual for there to be extreme variations in sizes versus the past history for that type or department of shoe. However, when variations do appear, the retailer needs to adjust inventory levels. Even small variations can have a large impact over time. The way to cover these variations is through an item-based automatic resupply system, and for that you need to use Minimums & Maximums.